I will take up my pencil, which I have forsaken in my great discouragement, and I will go on with my drawing." 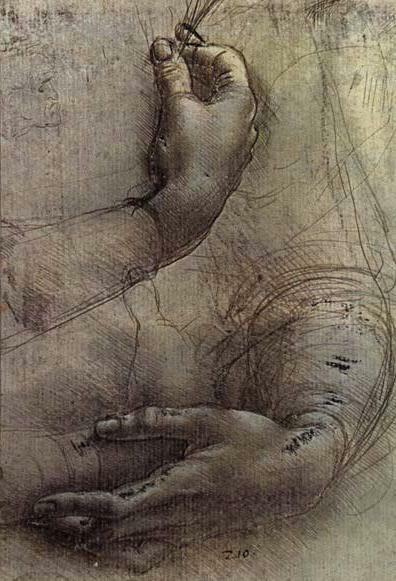 Leonardo da Vinci, Study of Arms and Hands. c. 1474. Drawing is the simplest and most direct method for making art. To draw, all you need is paper, a few pencils, a sharpener, and an eraser. Drawing materials are inexpensive, so invest in good quality supplies. Great for value studies. Gives us a sense of three-dimensional space and a great range of lights and darks with minimal effort. Known for expressive, direct and immediate qualities. Can create bold, thick lines or be sharpened to a point for more detailed marks. Use paper with a medium to heavy tooth or texture. Can be erased; smudges easily - can be controlled by spraying a synthetic fixative over the drawing. Willow charcoal is light-weight, hard and brittle. It is powdery and easily rubbed off. Vine charcoal is a fine quality natural charcoal made from hardwoods, which offers a full range of tone, yet is easily erased or blended with a paper stump. Compressed charcoal is made of powdered charcoal and is available in varying degrees of hardness. It has a good overall considency, but its dense tone can be difficult to erase and blend. It is available in squared bars, rounded crayons, pencils, chunks, and powdered. Begin lightly with the hardest charcoal and gradually darken the drawing with softer charcoal. Do not put harder charcoal over softer. Break into small pieces or sharpen for better control. Use a light hand. Build up your darker values slowly after fixing each layer to control smudging. Make sure to erase any smudges or finger prints before fixing. Made of powdered graphite (not lead) fired with clay, ranging in hardness from 6H to 8B, the softest, and encased in wood. A good assortment for freehand drawing includes: HB, 2b, 4b, 6b, 8b. Graphite is also available in bar, crayon, chunk, and powdered form. Use paper with a smooth or hot press surface that has very little tooth or texture. Can be erased; softer graphite smudges easily - can be controlled by spraying a synthetic fixative over the drawing. Begin lightly with the hardest pencil and gradually darken the drawing with softer graphite. Do not put harder graphite over softer. Use a light hand. Be careful not to score the paper surface with the harder pencils. A great resource for artists and art students who work with the human form. Stay tuned for more art media pages -- there are many art-making materials for study. I'll continue to add more all the time. *Online Art Instructors* - Please feel free to link to any of my pages for your online discussions and other learning activities.